Rural Action is partnering with Mountain Association for Community and Economic Development (MACED) from Berea, Kentucky to bring a forest carbon trading program to counties throughout Appalachian Ohio. To that end, Rural Action held three informational meetings on May 19 an 20 to help educated Natural Resource Professionals, Consulting Foresters, and Landowners in our region about this program, which is being called the Appalachian Carbon partnership. These meetings focused on how each group can participate in educating landowners about carbon credits as an income opportunity, as well as specific steps that landowners would have to take before enrolling in the Appalachian Carbon Partnership. The main presenter at the meetings was MACED Forester Scott Shouse, who explained the program and its requirements. Carbon credits represent the carbon that is stored in trees as they grow on actively managed land. These credits are a commodity that are traded through exchange markets, with prices and values that fluctuate similarly to other financial commodities, like stocks. The Appalachian Carbon Partnership’s goal is to give landowners market incentives for more active management and, as the carbon credit markets improve, to provide them with a source of income to help with taxes and management. Currently, MACED and Rural Action is running the Partnership through The Chicago Climate Exchange (CCX), one of the larger markets where carbon is traded which has more than 450 corporate and institutional members working to reduce their carbon footprint. CCX has experienced tremendous growth over the last few years - more than doubling their amount of contracts each year they have been in operation. As of 2008, the global carbon market was estimated to be $121 billion. Reflecting that trend, more than 11.2 million metric tons of carbon were traded through CCX in March 2009 alone. “There are going to be a lot of big companies entering this market and approaching landowners. 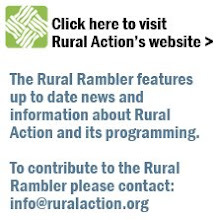 Rural Action has worked with landowners of all sizes since the mid-1990’s and our goal is about improving our region’s overall forest health and giving families more options, and eventually to have a product that can help smaller landowners,” said Decker. Earlier this year, the U.S. House Energy and Commerce Committee released a draft version of the American Clean Energy and Security Act of 2009 which calls for a cap-and-trade program requiring a 20% carbon reduction from 2005 levels by 2020 and 83% reduction by 2050. Forest land must be managed to in order participate, and management goals must be geared towards maintaining your woodland so that carbon dioxide can continue to be taken up by trees for at least a period of 15 years which is the length of enrollment. However, with the United States currently considering the roll-out of a Cap and Trade program on a much larger scale, timber producers may look at carbon sequestration in a new, economically advantageous light. “The important thing is for landowners to have a choice and take a look at whether a carbon credits program is right for their management goals,” said Shouse. Enrollment in this program is open to private forest landowners in the Appalachian counties of Kentucky, Ohio, Tennessee, Virginia and West Virginia (see map above). Forest landowners with 30 acres or more to their name are encouraged to contact us to learn more about this program. For more details, get in touch with Susi Rankis at Rural Action (susi@ruralaction.org) or call our offices (740.767.4938).